"How do you keep your home smelling fresh with your cat?" That's what a friend candidly asked me over tea recently. I told her I am quite zealous when it comes to cleaning William's litter box since Russian Blue cats like their little corner to be spotlessly clean. 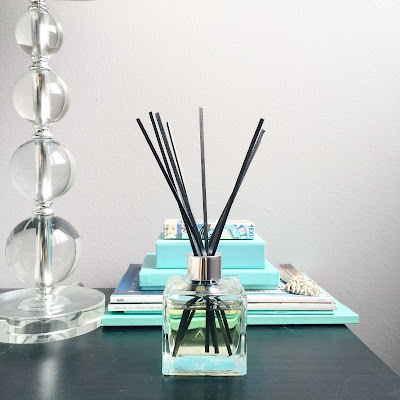 I also mentioned that although I enjoy burning candles to create a cozy atmosphere, there is something else I prefer to use when I want to get rid of ambient odors. Want to know my secret? I am an avid fan of the Lampe Berger. Aside from looking stylish and adding refinement to my home decor, the Lampe Berger purifies the air, destroys undesirable odors and adds a fresh fragrance to the air. All that in only 20 minutes! I don't know about you, but I have yet to find a candle that can permanently get rid of cooking, frying or garbage odors. Fill up the lamp with a parfum de maison, a fancy name to describe the Berger fragrance, which contains 90% isopropyl alcohol. 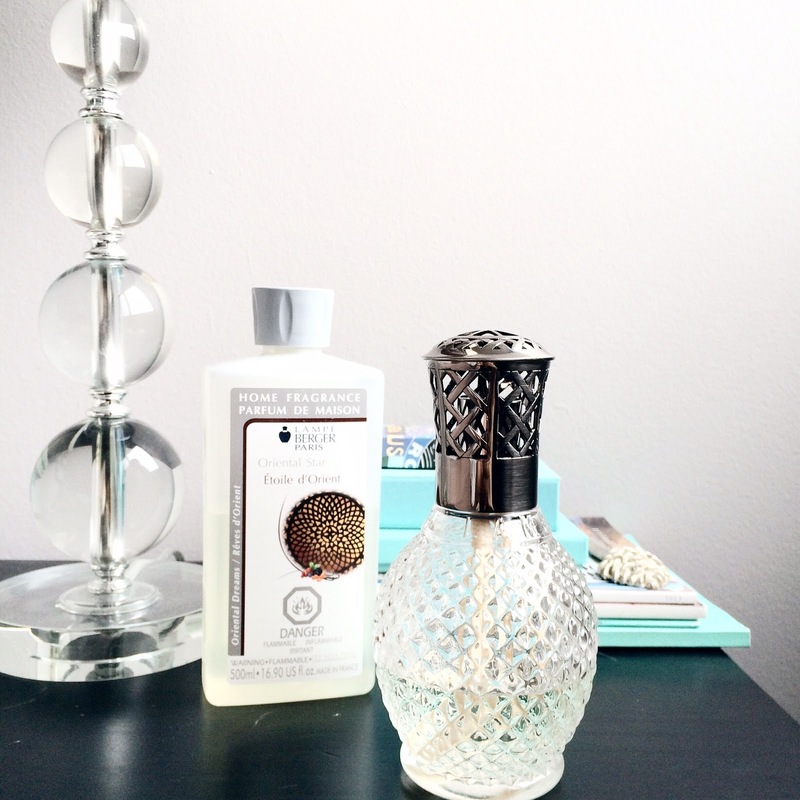 I highly recommend using the fragrances sparingly, otherwise, it can get easily overpowering. What you can do the first time you fill up your lamp is to pour half of the neutral scent with a fragrance of your choice. Once the lamp is filled up around 2/3, you simply light up the stone burner and wait 2 minutes before blowing out the flame. And voilà! The process invented by Maurice Berger, some 115 years ago, is called diffusion by catalysis. This means that a Lampe Berger takes the air in the room and uses it to fuel the burning of the alcohol in the stone burner. 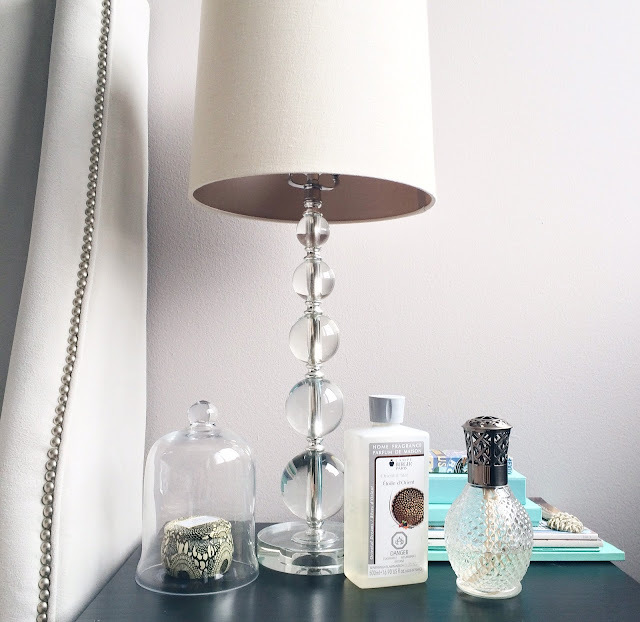 That is just how the lamp destroys unpleasant odors while adding a beautiful, but subtle scent to a room. It's pretty fascinating to see the lamp work its magic every single time. The best thing about the Lampe Berger aside from removing odours is that the lamp comes in a variety of style, from very simple to limited edition created by well-known designers, and with over 40 fragrances to choose from. Mine is named l''Originelle''after the first model sold by the brand in 1905. The combination of crisscross mounting with the pewter finish adds an elegant vintage feel to the lamp. In terms of fragrances, I have a couple of favourites depending on the time of year. For spring and summer, I like Lemon, Fresh linens, Precious Jasmine and Paris Chic, a floral scent with a touch of bergamot. Nevertheless, for fall and winter, I have a strong preference for musky fragrances such as Provence Treats and Oriental Star; I like how they add another layer of sophistication to my decor. A new addition to the Parfum Berger collection is the Cube Scented Bouquet, which offers another tasteful way to perfume a room. The Cube comes in 10 signature fragrances such as Zest of Verbena, Soap Memories, Amber Powder and Paris Chic. I have been pleasantly surprised with Vanilla Gourmet, which has nothing to do with the artificially smelling candles sold everywhere. It's such a delicious fragrance; It smells like fresh split vanilla pods mixed with rum and anise. Are you a fan of the famous fragrant lamp? If so, what is your favorite parfum de maison? Lampe Berger starts at $48, parfum de maison ranges from $24 for 500ml to $40 for a litre and Cube Scented Bouquet are sold $25. It's BOWVEMBER, Get PROCURE's chic Bow Tie!